Betway Sportsbook is not like other sports betting sites. Instead of running a complicated website packed with odds on every event imaginable, Betway focuses on the most popular categories, and they present their offers in a simple, classy format that is easy to use and understand. Wagers are available on all major events, from basketball and American football to ice hockey, golf, and more. 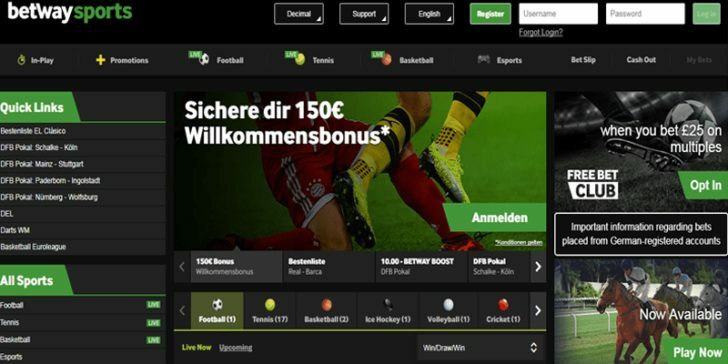 Upon entering the website of Betway Sportsbook, players will immediately see that E-sports are given an independent category, marked with purple colour. One of the largest variety of E-sports gambling is available at the online sportsbook. Online gaming enthusiast can chose from several games, including League of Legends, Dota 2, Heartstone, Starcraft 2, World of Tanks and Counter Strike: GO. Interesting E-sports betting markets are also available, for example gamblers can wager on League of Legends to be part of Winter Olypmics 2030. The odds for this option are 80.00 (79/1). 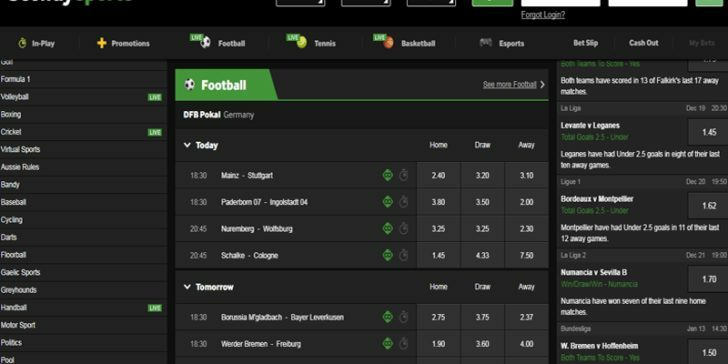 Bets related to sports betting are accessed using a simple menu, and can be filtered by time, showing only the events coming up in the next hour or two. Live Betting is also offered, letting punters put money down on matches as the action unfolds. Look for extras like live updated scores, betting strategies, and more. Betway Sportsbook offers a wide-range of bonuses and promotions. What is more, these bonuses and promotions including the Betway Sportbook Welcome Bonus are tailor-made for you. It means that there are different bonus offers for different countries. For example, if you are from the United Kingdom and want to bet on Terence Crawford vs Amir Khan boxing match, you can get £5 free bet after placing £5 BetYourWay bet (18+. Applies to single bets using any of the BetYourWay markets on the Crawford Khan boxing match taking place on the 21st of April 2019, only. Minimum stake is £5. Bet must be placed on odds of at least 2/1 (3.00) to be eligible. Promotion expires on the 21st of April. T&Cs apply). Customers from the UK can be a part of the Free Bet Club. If you opt-in for this promotion, you will receive £10 free bet after spending a minimum of £25 on any trebles (or higher) in a week (18+. Free bets are credited in 2 installments as £5+£5. Eligible qualifying bet(s) must have three or more selections. Bet(s) must be placed on odds of at least 2/1 (3.00) to be eligible. This refers to the total odds of the multiple bet, not each individual selection. T&Cs apply). Win Thousands of Pounds on Premier League Betting at Betway Sportsbook! The NBA In Play Promotion at Betway Sports has Everyone Talking! BetVictor’s Game of the Week Puts Free Cash in Your Hands! Insure Your Darts World Championship Betting at Betway Sports! Bet on Liverpool v Arsenal to get a £10 Free Bet Bonus at Betway Sports! Win GBP100 with K.O. in Fight of the Century at Betway sportsbook!